Dealing with your patient's anxiety. - Developing a relationship with the dental patient is a complex task, and the relationships longevity is often directly impacted by your dental patients experience during their procedure. - Regardless of how well the dental work is performed, if the patient has a bad experience, the relationship is affected. - Enabling the patient to effectively communicate their needs to/with you, during a procedure enhances the patient's experience and strengthens the relationship between the patient and you, the practitioner. Telling the patient to raising their hand is not enough. - Each procedure has an allotted time for completion, and frequent interruptions impact upon the allotted time for the procedure. - When the patient is equipped with only one hand signal, one that forces the procedure to stop for - both trivial and non-trivial requests, the procedure is prolonged causing frustration for your patient and you, the practitioner. 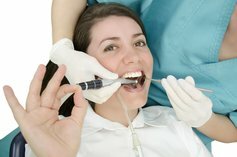 ​Why adopt/encourage DentiSign? If it's not broken ,don't fix it? What's in it for you? DentiSign allows you and the patient to become a team, and this team work ensures a better dental experience for you both. - If the patient can communicate their needs effectively with 'DentiSign', interruptions to the procedure -are reduced, resulting in both, a quicker procedure and better experience for all. If each dental experience is improved, the anxiety associated with a dental visit can be greatly reduced. How do you get feedback on your service? How much future service do you let walk out the door unknown to you? Up/cross positioning future services are difficult to do right after a procedure, most patients will nod when in the chair at anything you say, just to get out of the chair, with no followup. 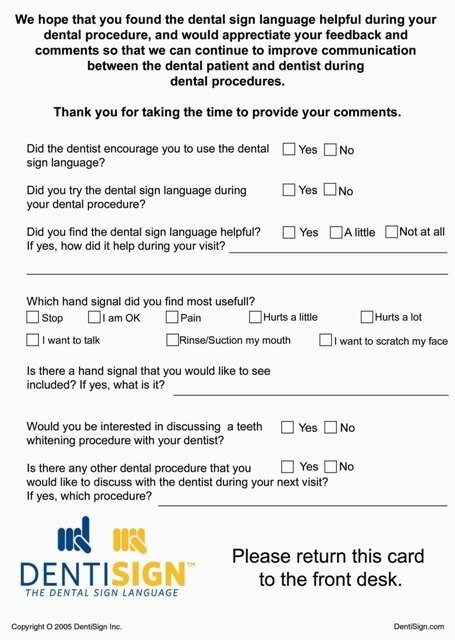 Patients respond to the questionnaire on the back of DentiSign 80% of the team un-prompted after a procedure. SImply print it out and place nearby.